Tentative captain of the Super Eagles, Ahmed Musa, has graciously handed over to Mikel Obi of Chelsea as the new captain of the team. He handed over during a parley with media at Ahmadu Bello Stadium, Kaduna ahead of the crucial qualifiers with the Pharaohs of Egypt 5pm Friday. The optimistic Coach of the team, Samson Siasia, who brands the team as the new Super Eagles, expressed confident that the Eagles will beat their Egyptians counterparts in the 90 minutes encounter tomorrow. Mikel Obi who has spent the longest time in the team, thanked Ahmed Musa for handing over to him as the pilot of deadly squad. “It takes a man to do what he has done so I commend him,” he said. On the game, Mikelsaid though it would be a tough match, the Eagles will do their best to win. 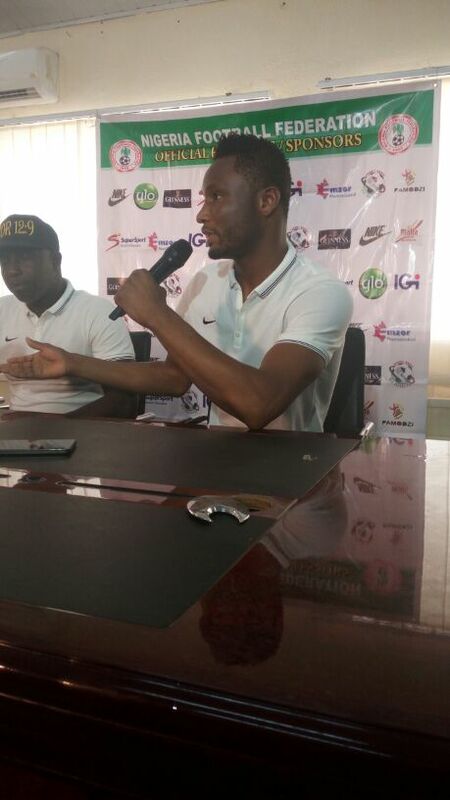 From Friday’s outing, Mikel will be the captain of the team. The Super Eagles presently trail their rivals, Egypt, by two points and need to win at least one of the matches to stay in contention to top their group. Super Eagles are currently under pressure from sport enthusiasts to win the match.